Cities Connection Project | STÄHELIMATT HOUSING DEVELOPMENT. ZURICH-SEEBACH. 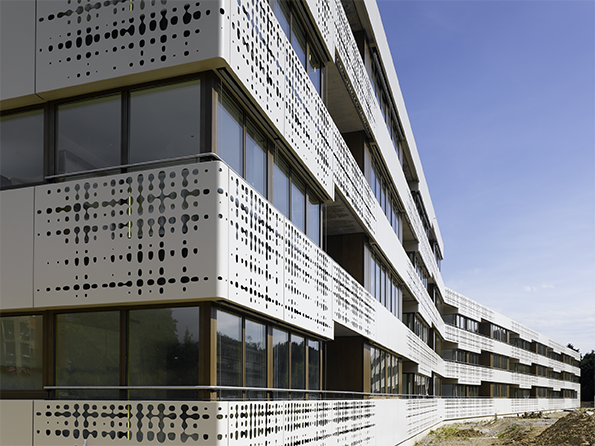 The location on the periphery of Zurich is characterised by a dramatic change in scale. While the settled area itself consists of a conglomerate of small spaces of the buildings, gardens, streets and squares, the city here leads, without transition, directly into the open landscape. 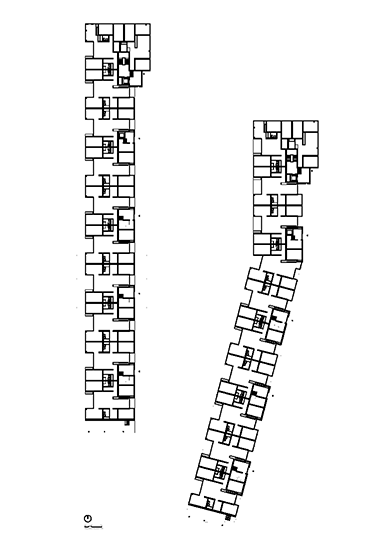 The two long building volumes derive their scale from the nearby landscape space, for instance through their layout parallel to the striking woodland edge or through the staggering of the building height, which seems to anticipate the rising terrain. By accommodating all the dwelling units in just two buildings and through the east-west orientation a lot of space is left which allows the landscape to flow in between the buildings. Complementary to this movement the volumes gradually become higher and more dense towards the rear. The way the volumes are developed reflects the changes in typology: the heavy northern ends of the buildings accommodate special apartments whose corner location can be experienced in the interior. The flexibility of an apartment floor plan can be measured by the degree of diversity that it allows within the fixed walls. The generosity of the communal living spaces, the nuancing of the individual spaces as well as zones that are deliberately “blurred” allow the same apartment to meet both the traditional middle-class resident’s requirements of his home as well as those of his neighbour, who teleworks from at home, has a patchwork family whose members do not always live there and the support of an au-pair. 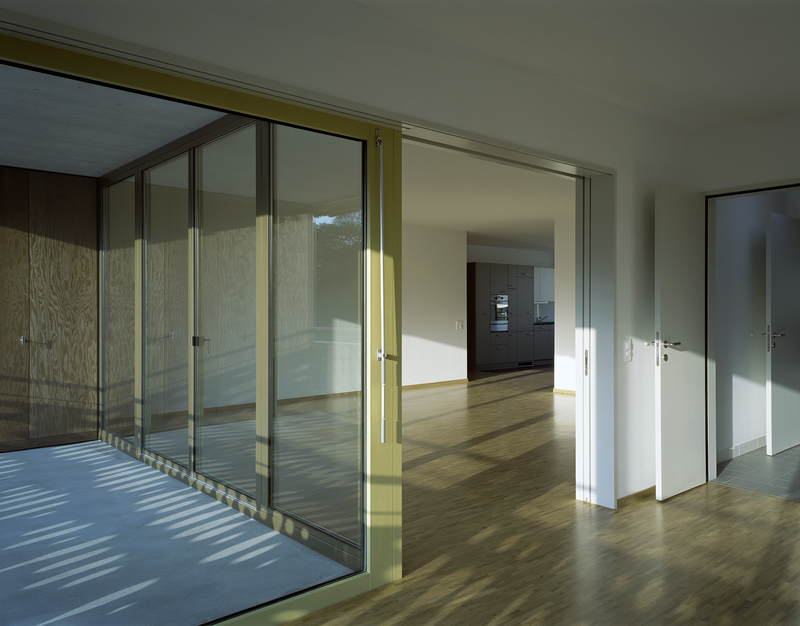 A few “additional” doors expand the way in which each room can be read and the possibilities of allocating it to the communal or private, daytime or nighttime areas. Continuous bands of sheet aluminium articulate the facades. The artist Jürg Stäuble has inscribed a perforated image in these bands which is based on overlaying two waves that spread orthogonally across the façades.